Let me preface this post with a disclaimer. I am not talking about children with various learning disabilities or other challenges. I’m talking about neurotypical kids who are just “stuck” in their learning process. Have you ever felt that your children just cannot learn? I have……want to read what I do when I feel like we’ve hit a wall in our learning? Read on! 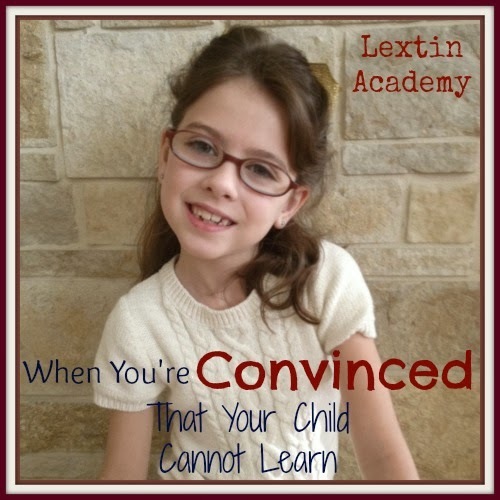 Have you ever been convinced that your children cannot learn? I have had days when I’ve told my husband that my children have lost their tiny little brains and they are incapable of intelligent thought. They don’t and can’t “get it”! There are many days that I question my own ability to teach them. I mean, do I really know what I’m doing here? Not always…..but I do know how to ask for help when I need it. I can read a teacher’s manual. I do know how to research. And I am absolutely determined to do my very best for my children. So, while I’m not omniscient, I do care about their education greatly-as well as their character-and I think that makes me the perfect person to learn alongside them and gently direct their path. I love it when I see those light bulb moments of understanding in my kids. But some days. Whew! On those days I just know there is nobody home in their minds and they just are not ever going to learn what I’m trying to teach them. When you homeschool you will have lots of moments like this. You will know that your child’s brain has fallen out and with it went every single thing you taught them the day or week before. Some days you are sure they have forgotten everything they know. You will wonder if they were abducted by aliens during the night and then were brainwashed. Who is this child sitting across from you who can suddenly no longer spell or add but just yesterday could write a full paragraph with properly spell words and add huge sums in her head? Other times you will have weeks or months of time when a topic or concept just will not sink in. It was never there in the first place and no amount of pounding, pushing, or prodding will get that concept into their head. You have explained and demonstrated in 50 different ways and your child still stares at you blankly, shrugs, and then asks what you’re having for lunch. You are astounded because you just taught them something wonderfully awesome and they missed it completely. What is wrong with your children? Why can’t they learn it? Why don’t they get it? This will absolutely happen in your homeschool. It will happen many, many times. You will question if they have a mind and know how to use it. You will wonder the same thing about yourself. You will also wonder if you have the grace and patience to make it through this frustrating time. Let me give you a few tips to get through this time. Try something new – try a new game, a new tactic, a new book, a new curriculum. Sometimes you simply need a new approach. Find support – You might need a tutor, an online teacher, a video course, or your spouse to take over the teaching. When you’re both frustrated it might be best to let someone else struggle through with your child. Review – maybe you need to try reviewing or doing some easier and less stressful work in that subject. There might be a concept in earlier lessons that didn’t quite stick with your child and that might be the reason for your current struggles. Keep practicing – there also might be times that you need to simply keep practicing and not give up. Your child might need to work on that same topic for a week or even months. Don’t push them forward on your time table but allow them time to really build a foundation and deeply understand the topic. Relationship – Your relationship with your child is more important than mastering spelling words or multiplication tables. Take breaks, get tutors, or turn teaching over to someone else if one subject is dramatically damaging your relationship. Encouragement – Your child needs you to be their biggest cheerleader. How you react to his/her struggles will color your child’s self-worth and image of himself or herself. Your child needs you to believe in him or her. Flexibility – You might have to throw out your carefully crafted lesson plans in favor of letting your child’s ability lead the way in learning. You will have to readjust your schedule and try new techniques. Patience – You will be forced to learn patience. You will have to keep your thoughts to yourself and be patient as you wait for understanding to dawn and progress to be noticeable. Waiting through struggle is so hard. Grace – You must give grace to your child when they struggle and understand that learning is challenging. But you must also give grace to yourself. Although you are not a perfect teacher, you care and are doing a fabulous job. Sometimes the child just isn’t ready to learn a concept and it may have nothing to do with the teacher, curriculum, or approach. Come back later this week to read our story or a time when I was absolutely sure our oldest daughter could not learn, what we did about it, and what I learned through the process. I have found this often in maths. We use a UK curriculum which visits the same topics each year but at a greater depth. What seems to happen is that the next year, we might do a day or two on the topic at the previous year's level but the difficulty has gone away and we just go onto the topic at the correct level. It doesn't seem worth spending ages unless it is something so fundamental that the rest of the year's work becomes impossible. It seems to be a maturity thing. Thanks! I enjoy linking up each week Wendy! And SarahElisabeth Jones – it is so nice when the difficulty melts away and we see progress! I love when they "get" it! It is definitely a maturity thing. It's just sometimes hard to know when to teach certain topics because every child is so different!